Since bursting onto the New York restaurant scene in 1985, Danny Meyer has built an empire on a simple, yet disruptive business philosophy: deliver on a promise of warm hospitality by putting employees first. “Business, like life, is all about how you make people feel. It’s that simple, and it’s that hard,” Meyer writes in his book, Setting the Table, a tour de force of business insights and life lessons learned in a career that has spanned three decades and earned him and his collective staff an unprecedented 26 James Beard Foundation Awards. Meyer, head of Union Square Hospitality Group (USHG), is transforming American dining with a careful, thoughtful approach to business that makes a clear distinction between service (“the technical delivery of a product”) and what he calls enlightened hospitality (“how that product makes you feel”). Known as an innovator in the restaurant industry, he announced last month that tipping would be eliminated at all of USHG’s New York restaurants, beginning with The Modern—a bold move that aims to level the playing field between servers and kitchen staff. Meyer recently sat down with Blueprint, presented by CBRE, to talk about the importance of a strong workplace culture, the keys to harnessing talent and cultivating leaders, and why “placemaking” matters—all through the lens of hospitality. Blueprint, presented by CBRE: You talk in your book about the distinction between service and hospitality. How did you arrive at that approach and then successfully apply it in all of your restaurants? Danny Meyer: I arrived at the distinction one year when the Zagat survey came out in New York City. Back then, we only had Union Square Cafe, which was all I did for almost the first decade of my career. I was amazed to see that Union Square Cafe had become New York’s third-favorite restaurant, which is a big deal in a city of 26,000 restaurants. Yet, in that year, our food score was 12th best in the city, our service score was 10th best in the city, and our decor score was 65th best. The three things Zagat was asking about were food, decor and service. I asked myself, “How can we be New York’s third-favorite restaurant when none of those categories came close to being No. 3?” That was the year that it really hit me, that there must be something Zagat was not asking about; and it was hospitality. It was a breakthrough moment, for us, to understand that the word service has a really important meaning but it also has limitations in terms of what it does. Also, that was about the time that Union Square Cafe had won the James Beard Award for Outstanding Service in America. I didn’t buy it. I mean, I’m really proud of our service, but we’re wearing Brooks Brothers shirts and khakis; we’re not in tuxedos, we’re not saucing your pasta at the side of your table. How did we win that? I believe that it encouraged me to really try to understand what does service mean and what does service not mean. That was the point at which I uncovered that hospitality is a completely different element of the experience, and that hospitality does not only apply to businesses that are classically thought to be in the hospitality field. Hospitality is a business principle that applies to, really, any organization. Staff prepares at The Modern, a USHG restaurant overlooking the Museum of Modern Art’s Abby Aldrich Rockefeller Sculpture Garden in New York City. Blueprint: USHG has a robust training program for its employees that allows many of them to be cross-trained in different restaurant and management skills. Do you think such a program helps to build a happier and more productive staff? DM: Absolutely. I think it’s a well-known concept that the more you can empathize with everybody in your work community—having walked a mile in her shoes or his shoes—that’s a really strong thing. I think that a big part of our culture is “servant leadership,” which we certainly didn’t invent, but it’s the notion that you basically flip the classic work chart and you let gravity work. If I’m the CEO of the company, instead of being the top of the pyramid, I’m actually at the bottom. The pyramid is flipped upside down. All accountability rests with me, but my primary job is to serve the people who I’m asking to serve our customers, who will then be responsible for serving their communities and our suppliers and, ultimately, our investors. Nobody is suggesting that I should go be a pastry chef because you would never come back and have dessert in our restaurants, and nobody is suggesting that I be the sommelier, even though I know a fair amount about wine. I think our sommeliers are pretty damn strong. But it’s really important that I appreciate what they go through and that I go to work primarily for the purpose of serving our employees. Not because I don’t care about our customers; to the contrary, I think that we stand a much greater chance of having an awesome customer experience if, first, our employees are having the best possible employee experience. Blueprint: Do you think that concept could be successfully applied across industries, not just in the restaurant business? DM: Yes. We have a company now called Hospitality Quotient. It’s a consulting company that’s part of our Union Square Hospitality Group. We work with organizations and businesses that are already the best in the world for what they know how to do, but want to append this hospitality strategy. We’re working in healthcare, retail, transportation, law, education—really, any kind of organization that has become commoditized to some degree because of the access to information that the Internet has provided. It’s not, any longer, what you know that is the primary currency, it’s how you make people feel along the way. It’s, for me, the greatest opportunity in business that the Internet has provided. In a world where technology is, pretty much, at the foundation of everything we do, those who understand the people’s need for high-touch has only increased. If you can use the technology to support your ability for touch, I think it’s the greatest possible tool you’re going to have. Blueprint: Great restaurants have a transformative power to revitalize neighborhoods. 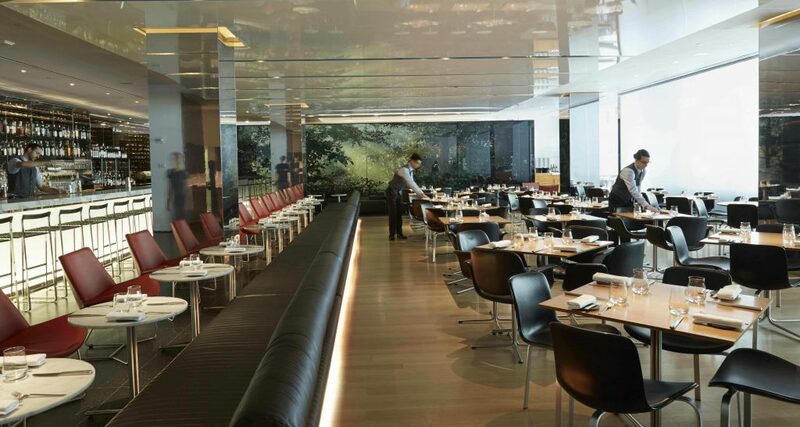 What makes a restaurant space great? How do they fit into the fabric of their cities and, in some cases, make neighborhoods better? DM: Well, as Howard Schultz said when describing the real purpose of Starbucks, I think restaurants, at their best, become that “third place.” It’s not home, it’s not work, but it’s a place that you go that’s very social. It’s one thing we can continue to do, that you cannot do just using your iPhone. It’s not just that we cook your food and do the dishes. We provide a social atmosphere for people to come together, which really goes all the way back to the tavern in any given town hundreds of years ago. That’s where people came to do politics, social, business. It’s the same today. I’m really interested in a notion called essentiality. There are so many non-essential things in our lives today—businesses that are not essential, songs that are not essential. Let’s say there are 4,500 songs on your phone. You like them all or they wouldn’t be on there, but I bet that there are at least 10 songs in your collection that every time you hear them, you just feel better and you go, “My life got better because that song was written,” or, “My life got better because that musician was born.” I want to build businesses that, in a sea of non-essential businesses or restaurants, when we open one of these in your neighborhood, you’ll go, “My life just got better,” as opposed to the hundreds we walk by all day, where if they had never existed in that location, your life would be just fine. The team of chefs at Gramercy Tavern. Blueprint: You’ve recently made the decision to eliminate tipping at your restaurants, which is a major shift in the way restaurants have operated in the United States and a move that restaurateurs are going to be closely following. How did you arrive at that decision? DM: We’re seeing a world in which tipped employees, in the fine dining world, have been able to increase their income rather substantially over the last 20 or 30 years. During that same period of time, non-tipped employees have barely gotten a raise. There are many, many problems there. No. 1 is that the tip as a means of encouraging better service is completely anachronistic. It’s irrelevant. When you leave a tip on the table in most fine dining restaurants, that tip gets shared amongst all of the tipped employees. While you think you’re either rewarding or punishing service, that tip is being shared, probably 10 to 20 ways by a whole team. None of that tip may go to cooks or non-tipped employees, who, by law, are not allowed to share in the tip. The tipping system is completely antithetical to the team spirit that it takes to create a great dining experience. As a result, we’re finding that the tipping system is completely antithetical to the team spirit that it takes to create a great dining experience. The guy making the risotto, I promise you, worked just as hard as the person who pulled the cork on your wine. Restaurant economics, as they now stand with tipping, reward one and not the other. That breaks down team morale. As a leader, it makes it really hard to lead the team. It also makes it hard to lead a team when a really bad tipper might stiff a waiter because the food took too long and the waiter had nothing to do with why the food took too long. Neither the reward nor the punishment is effective. The system itself is creating a non-sustainable moment in time, where people want better and better and better food, and fewer and fewer and fewer people are interested in learning the craft of cooking the kind of food you love for the opportunity to earn $10 or $11 or $12 an hour. Meanwhile, as minimum wage goes up everywhere, what it’s going to do is exacerbate this because all restaurants will be raising the prices next year, and as they raise their prices, tipped employees will continue to make more and cooks and non-tipped employees will continue to be flat. It’s going to only make this worse. We said at this moment in time, if everyone is raising their prices, I want to raise our prices and have the tip be included, and then have it be completely my decision as to how to distribute compensation within our businesses. Tipping is, basically, an American invention that got created immediately post-slavery. It was an opportunity to have businesses continue to get free labor and put the onus on the customer to pay them. This was in restaurants and it was on Pullman train cars. In all these years since slavery, the tipped minimum wage has gone from zero to $2.13. That’s just wrong. Most restaurants in the country are not fine dining restaurants, it’s someone working in a diner or a big chain and they’re making $2.13 an hour. They don’t pool tips and they’re working at the behest of all these masters. It’s a master-servant relationship. There’s a whole lot of philosophical reasons I don’t want to see tipping continue. From a business standpoint, we just will not be able to attract the culinary talent that it takes to stay competitive. Blueprint: Who would you say was your greatest mentor and what’s the best piece of advice you’ve received? DM: For whatever reason, I’ve had an ability to pick many, many, many mentors as opposed to any one. I think every human being has gold and flaws. I think that the reason so many of us have so few mentors is that we’re trying to find someone without flaws. I think I have a special ability to look past human flaws and see the gold that everybody has, that I might be able to learn from. I’d say that among my mentors is my late maternal grandfather, whose name was Irving Harris, from Chicago. He gave me a lot of advice, and he gave me one really bad piece of advice, which was, “Don’t get into that rotten business,” when I told him I wanted to go into the restaurant business. I’m very happy to have ignored that piece of advice. The fun is actually building a team with whom it’s really fun to solve problems. But he also gave me a fantastic piece of advice, which was that the definition of business is problems. The goal of business is not to eliminate problems, it’s to be better at solving them than the next guy. What’s great about that advice is that you don’t feel horrible when you have a problem. The fun is actually building a team with whom it’s really fun to solve problems. In the same ways, it’s like building a sports team. If you’re building a winning baseball team, you’re trying to solve some problems like, how do I hit those pitches from the other team and how do I field those ground balls? You’ve got to have a team of people who have special gifts, but maybe even more importantly than how strong everybody is at their technical skills is how much fun are they to play with in the sandbox, because it’s got to be both. There are lots of teams of people that are a bunch of would-be superstars who don’t play nicely with each other. If going to work is, really, going to play and the game you’re playing is problem solving, that’s a great mindset. Then you get to pick: who do I want to go solve these problems with? Just like how much fun it was when I was a kid, playing touch football across the street, getting to pick who is going to be on my team. I really look at this as a big game. And I don’t say that in the sense that it doesn’t matter, but in the sense that it can be a lot of fun.